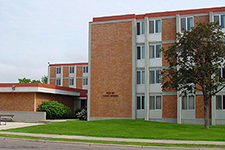 This residence hall was built in 1962 and named for Helen Hill, a former faculty member. It houses 150 women along with St. Cloud State University's Health Services facility. From 5th Avenue turn east on 6th Street S. Follow 6th Street two and one half blocks to 3rd Avenue; Hill Hall is on the Left. The nearest public parking is the pay lot at 4th Avenue/5th Street or the James W. Miller Learning Resources Center pay lot. Street parking may also be available.